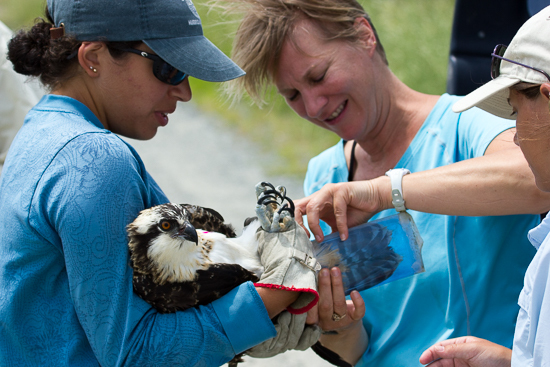 Monitoring the buildup of chemical compounds in ospreys helps scientists track toxics in our waterways. 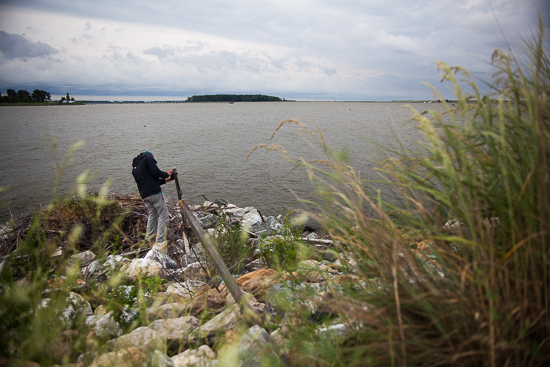 For almost two decades, state and federal partners have worked to rebuild Poplar Island in the Maryland waters of the Chesapeake Bay. Once home to a sawmill, a general store and a schoolhouse, the island succumbed to sea level rise, shrinking to a fraction of its size by 1996. Rebuilt using sand and sediment dredged up from the bottom of the Bay and hand-planted with native marsh grass, the island has become a refuge for 175 species of shorebirds, songbirds, waterfowl and raptors. 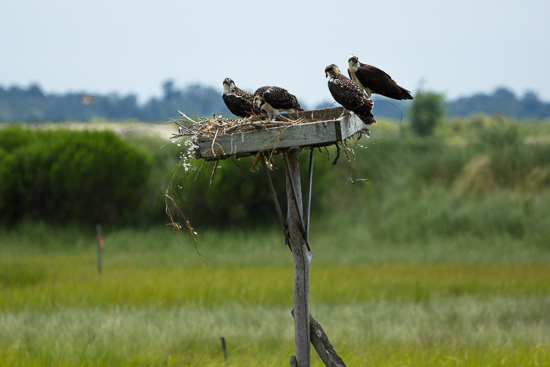 Eastern bluebirds, black ducks and snowy egrets are among the birds that nest on Poplar Island, but it is the osprey whose presence stands out. 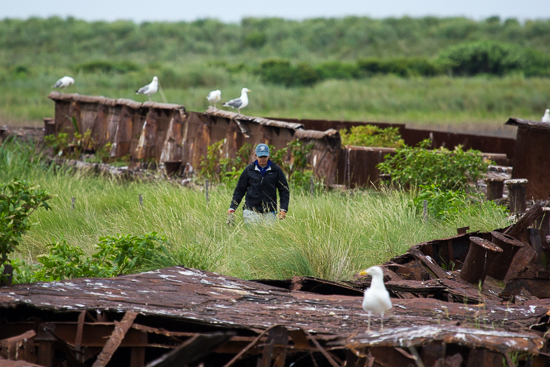 Their sprawling nests can be found on wooden platforms, abandoned barges and Bay-side rip-rap. 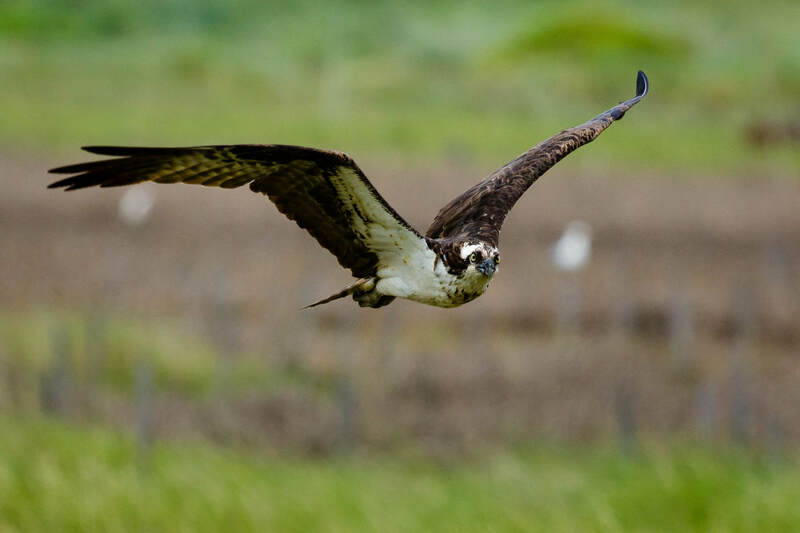 Plentiful food and nesting space mean Poplar’s osprey population is healthy, and can give researchers like Rebecca Lazarus an idea of what the birds should look like under the best environmental circumstances. Working with the U.S. Geological Survey (USGS) and the U.S. 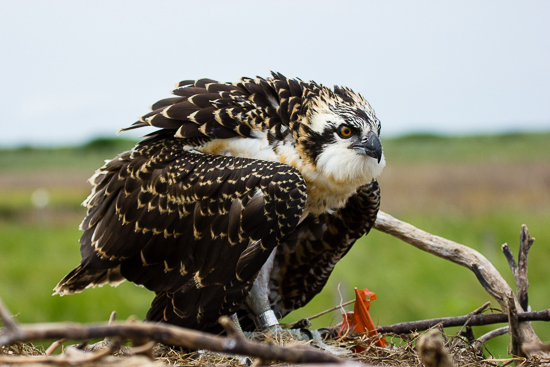 Fish and Wildlife Service (USFWS), Lazarus is studying contaminant exposure in osprey around the Bay. Because the birds sit at the top of the food chain, their health is an indicator of environmental problems. 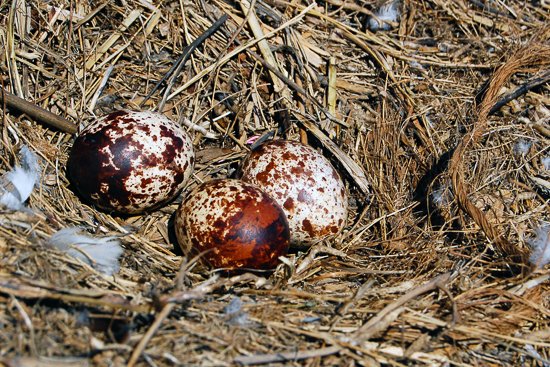 Tracking the buildup of chemical compounds in the eggs and blood of birds that Lazarus calls a “sentinel species” can tell us what toxics are present in our rivers and streams. 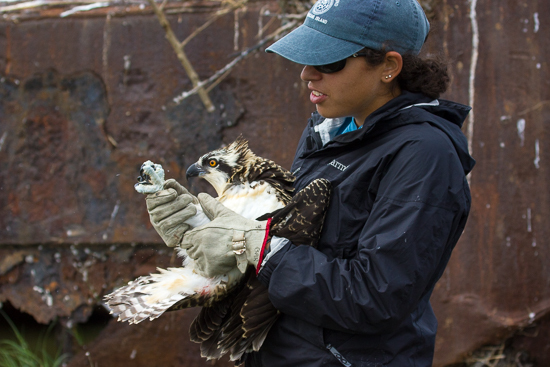 Lazarus started her season of research when ospreys returned to the Bay in mid-March. 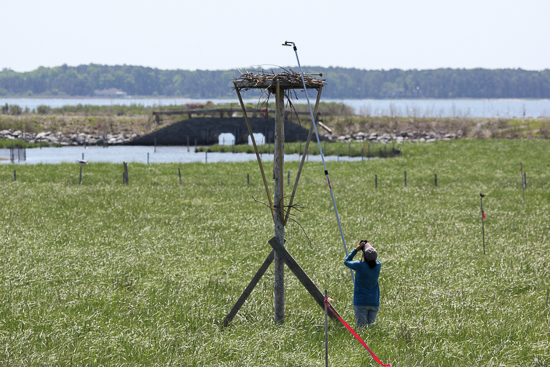 The University of Maryland doctoral candidate and USGS employee visited nests, counted eggs and watched the ospreys grow. 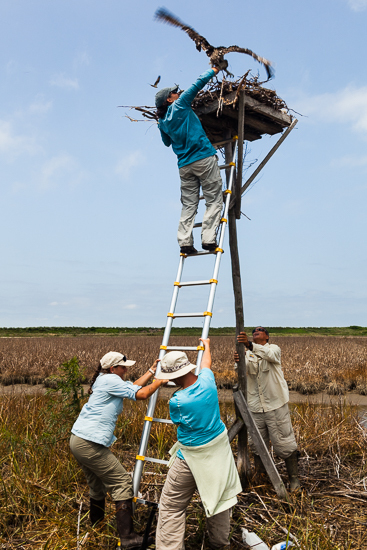 Once the chicks hatched, Lazarus used motion-activated game cameras to monitor their diets. The birds on Poplar eat almost exclusively striped bass and menhaden, reminding us that the management of these two fisheries has a big impact on the balance of the Bay ecosystem. As the chicks grew, Lazarus tagged each one of them with a metal band. She measured their weight and culmen length, and took samples of blood to test for chemical contaminants. 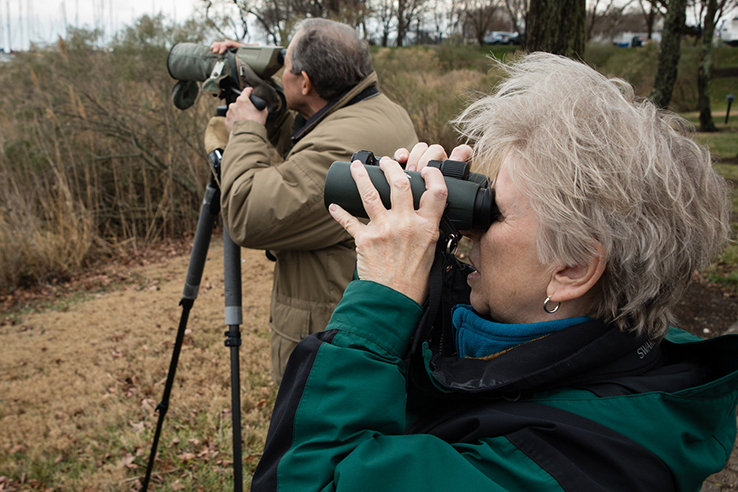 The last large-scale study of contaminant exposure in osprey was conducted close to a decade ago, and found elevated concentrations of polychlorinated biphenyls (or PCBs) and flame retardants in egg samples from the Anacostia and middle Potomac rivers. 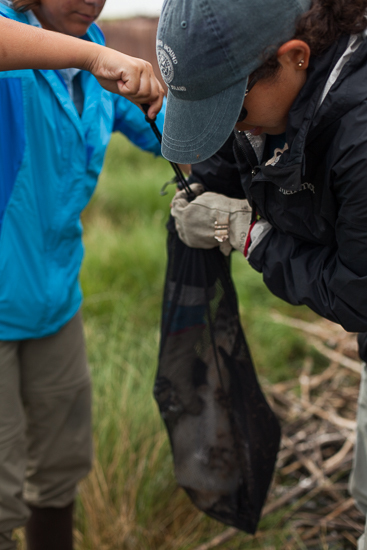 Lazarus hopes her updated research will show us what contaminants persist in the watershed, posing potential threats to wildlife and human health. The birds on Poplar are healthy and serve as a benchmark against which Lazarus can compare those that nest in more polluted parts of the Bay. 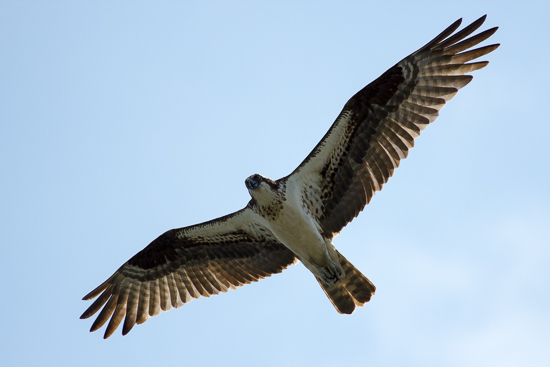 Ospreys experienced such a strong population boom after the United States banned the insecticide DDT and other contaminants that they are now nesting along urbanized waterways where dense development, wastewater treatment plants and the flow of pharmaceuticals and other new toxics into our water have concern about their potential to thrive. 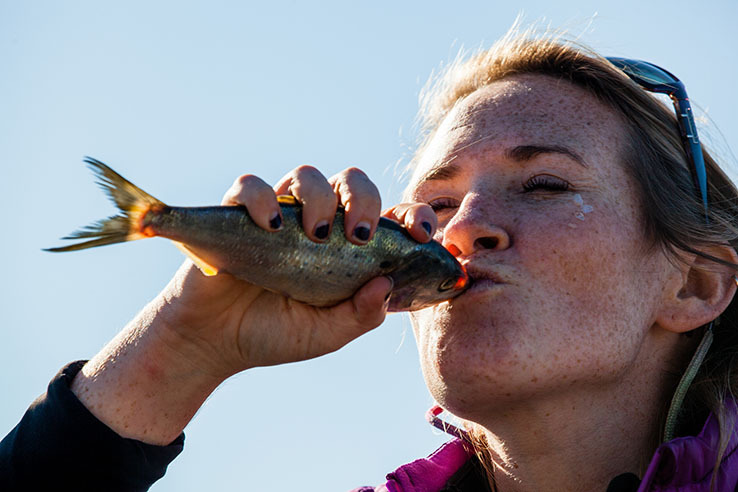 By monitoring the link between clean water, contaminant-free fish and healthy osprey, Lazarus has taken a holistic approach to her research. Once published, her findings could help state and federal agencies develop plans to mitigate pollution or prioritize contaminants of concern. And they will help improve the environmental quality, ecosystem integrity and sustainability of the Bay. 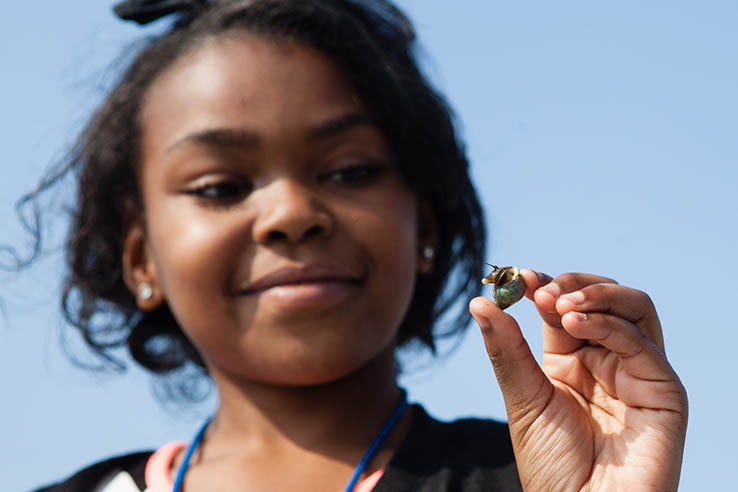 To view more photos, visit the Chesapeake Bay Program Flickr page. Images by Steve Droter and Olivier Giron. Love this! So glad there is a Chesapeake Bay Program! Nice work Catherine, Steve and Olivier! Looking forward to seeing results of this research.